Woah, we’re going to Ibiza! …Well, I went, and I wanna go back. Please? Why do holidays have to go so quickly? Last week, me and Aaron got back from a week away in Ibiza and it was absolutely amazing. It was our first summer holiday together on our own for two years, so it was really nice to get away. The trouble is it goes so quickly! I’ve posted most of these photos on my Instagram, but I thought it’d be nice to include them in a blog post and go into more detail about where we stayed and what we got up to. 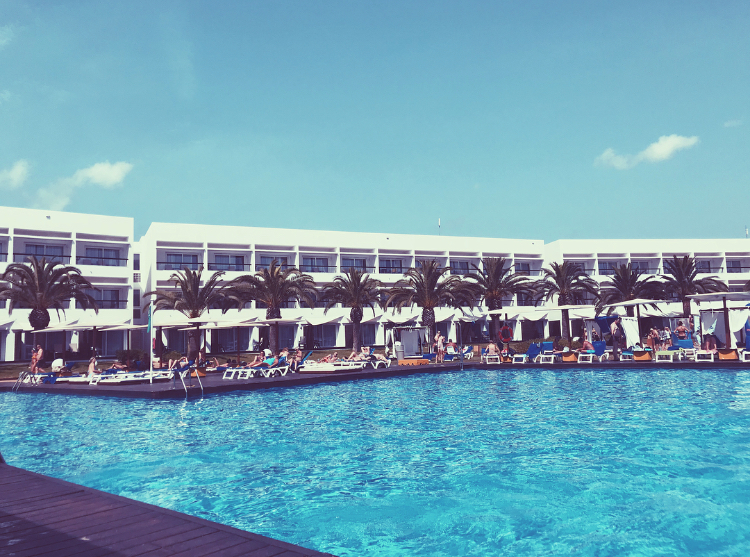 We stayed at the Grand Palladium Palace Ibiza Resort & Spa (5*), situated on Playa d’en Bossa. Honestly, the hotel was out of this world and we knew instantly that we’d done well with choosing the hotel as soon as we walked in. We were greeted with refreshing towels and mocktails! It really was that 5 star experience. We stayed all inclusive so I was already so excited about the unlimited food and drink to follow over the next seven days, haha! On our first day, we ventured around the hotel to explore and also headed down to the beach (Playa d’en Bossa). We discovered that there were gates in our hotel that led straight to the beach, so it was about a 5 minute walk, which was amazing! The beach was so gorgeous and the sea was sooo nice. You could just walk straight in without feeling cold and it was so refreshing. What better way to start the holiday than with making the most of the unlimited cocktails by the pool?! Look how big it is! I couldn’t get over the size of it when Aaron brought it over to me, I definitely wasn’t complaining though. Tequila Sunrise (pictured above) is definitely one of my favourites, but then I discovered a cocktail called a Pomada. It was gin with a cloudy zesty lemonade mixture, with some fresh lime as well. I can’t tell you how refreshing it was. I got through a fair few of those! This was the lovely view we had from our sunbeds by the pool. We stayed in this spot for most of the holiday as it was nice and close to the pool and had a great view of the resort. That wooden decking got soooo hot in the sun so the closer to the pool, the better! There was always something fun to watch and get involved with by the pool, whether that be a dance performance, aqua fitness, water polo, water volleyball, etc etc. I’m not very sporty at all so I just stayed and chilled on my sunbed, but Aaron had a go at some of the activities a few times and he said it was great fun. As I mentioned, the beach was absolutely gorgeous and it was a really nice chilled vibe. There were a lot of bars right on the beach that served food and drinks throughout the day. You could actually pay to sit on one of their fancy sunbeds (you know those ones that look like a huge double bed) but we didn’t go for that because it was a fair bit of money just for one day. So we just sat on our towels on the sand and listened to all the nice music. Our hotel did give out some head/back rests to take with us down to the beach, which made sitting on the beach much more comfortable. And it was included in the all inclusive price, so win win! One of the beach bars was called Coco Beach. I saw this nice little photo back drop so hey, why not take a snap? My bikini here was River Island from a couple of years ago. A lot of the beach bars did actually close around 9pm, which we thought was quite odd as bars here in the UK would never shut that early. I guess we’re not really used to the day bar culture that they have in Ibiza. However, one of the bars did stay open until 2am, so a couple of evenings we went down there for a few cocktails as a treat. These cocktails were from Nassau Beach Club, a bar just outside out hotel, which was full of really fancy chairs and tables and had a DJ too. It was really cool! The cocktail I had was called a Mediterranean Breeze, which was a vodka cocktail with lots of fruity flavours. Delish! Aaron’s was a creamy cocktail made with rum, and it had a marshmallow on the top! Yum. A lot of the evenings we just made the most of exploring our beautiful hotel, enjoying the hotel entertainment and sipping cocktails. We’d never been to a hotel before where there was so much to do and see, so we really made the most of it. There were so many pretty photo spots, but this was one of my favourites. The lighting was just perfect as well because it was golden hour (apparently the best time to take photos?) so I just had to take a snap. My top, shorts and shoes are all from New Look. On one night, we went out for a really fancy meal at Montauk Steak House located in Ushuaia Beach Hotel, as a belated three year anniversary/end of long distance treat. The decor was stunning and really unique (check out those bum chairs, ha!) and the food, service and all round experience was just amazing. It was an expensive meal but for a one off treat, we didn’t regret it one bit. The staff were so attentive and knew the menu like the back of their hand. To start, we chose cured Iberian ham, which was actually carved from the leg right in front of us. It was like nothing I’ve seen (and tasted) before! We were also given a selection of breads and salts from different parts of the world, one being Ibiza. The attention to detail was honestly phenomenal. Then for main, I had a fillet and Aaron had loin, and they were both cooked to perfection. All in all we couldn’t fault it. I wish I could eat it all again! As I said, the steakhouse was located in Ushuaia, which is one of Ibiza’s biggest club hotels. It was very very fancy, but as you can see, it is truly beautiful. Just look at that view! As I discussed in my previous post, there’s a lot of pressure to feel totally body confident in a bikini and look your best. No matter what anyone thinks, I was absolutely going to whip my bikinis out on holiday and let me tell you, I actually felt better than I thought I would! This bikini is from Topshop and I just felt like it flattered me in all the right places. I’m not usually one to take bikini photos, however I wanted to push the boundaries and show people it is okay to wear a bikini and feel proud of your body in it, which will hopefully make lots of other girls and women out there feel more body confident too. Here’s one of the other pools in our hotel (I think there were about 4 in total?). It looked so beautiful in the golden sunlight, just before it started to set. Doesn’t that water look so inviting? I LOVE Ibiza! Now this was just screaming photo opportunity. This ‘LOVE’ sign was located just outside one of the hotel restaurants, against the beautiful river and greenery. Just picture perfect! So many people took photos in front of this sign every night, so I just had to join in. Again, it was at that perfect golden hour time. I have to say all the photos I took around this time just turned out so so much nicer. There were so many pretty corners of our hotel. I’d never stayed in a hotel with so many gorgeous pink flowers scattered all over the buildings. I think it added such a beautiful touch to all the white. Plus, flowers are a blogger’s best friend, so I had to snap a little pic. This is the same pool as above, but a little later on in the evening when the sun was setting. The sky was a bit more cloudy on this day. To stay real, I have edited this photo to make the sky look more pink than it actually was. But, I think the outcome of this edit is so cool and I wanted to share it with you! And lastly, a little selfie with my favourite person ever. I asked Aaron if we could take some photos together on our little terrace, because when I think about it, we hardly ever get photos together! So, I had to make the most of it. I actually love this photo, especially with all the palm trees in the background giving me all the holiday vibes! I couldn’t have asked for a better holiday and was so lucky to be able to spend it with Aaron. Have you ever been to Ibiza? If so, do you have any recommendations for places to visit there?